I commend these ladies for having the guts to defy convention knowing that their choices are going to be scrutinized, sensationalized, judged, and exaggerated a thousands times more than a regular bride. I may not personally like their choices but I have high respect for these Rebellious Celebrity Brides for the simple reason that their courage is such an inspiration. 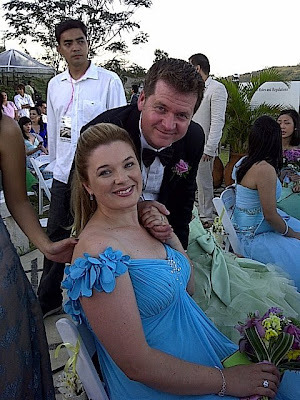 Here are the Rebellious Celebrity Brides of 2010 - early 2011. Starting off with the most scandalous of all. Maggie Wilson and Victor Consunji's pre-nup video made by Jason Magbanua, has been so controversial that it earned an article in Inquirer, a story in 24 Oras, and even a topic in Kapuso Mo, Jessica Soho no less. It became a topic in social networking sites among some ladies who were so appalled and offended by the video that they crucified Maggie for it. It got so out of hand that Jason trended in Yahoo! and eventually, if I'm not mistaken he took it out from his Vimeo account. People even call it a "scandal video"! But the couple swears that the important people in their lives appreciate it--and really, that's what matters the most, right? videos or shows or movies and she's probably sick of a white gown. So she wanted to wear red. Of course these are just my assumptions but what if the reasoning behind it WAS like that? Who are we to get so affected that she didn't wear white? If her groom loved it, and she felt gorgeous in it, so who are we to say her Monique Lhuillier gown was inappropriate? 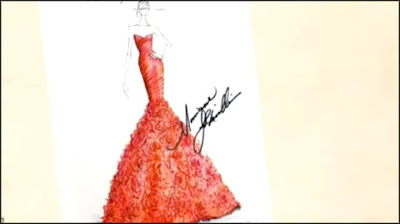 I reckon the fact that it's Monique Lhuillier regardless of its color, made it appropriate--hehe. 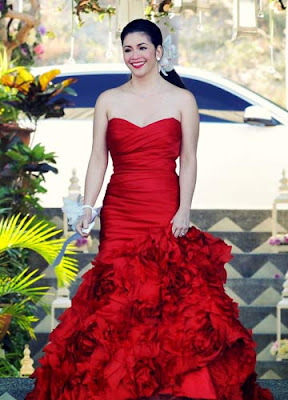 Another rebellious thing that Regine did on her wedding day, was to actually invite Ogie's ex-wife. She was even part of the entourage and made bouquets for the wedding. The fact that the ex was so involved in the wedding, is something I would never do even if I call myself a Rebellious Bride. I just can't stomach it. But hey. Again, I commend Regine for the maturity and the guts. And finally we have Kristine Hermosa. 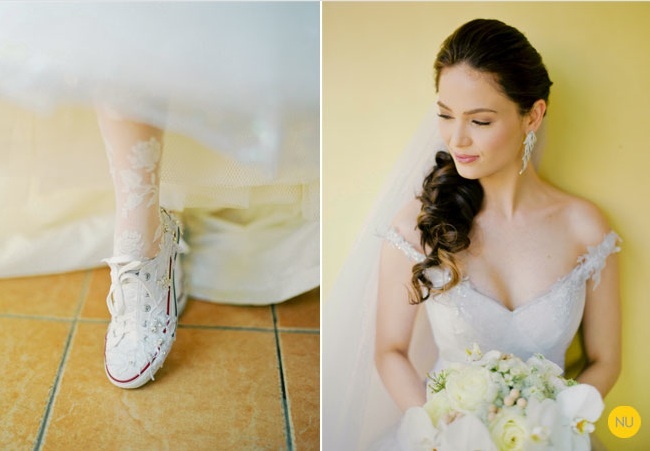 On a more "shallow" rebellious level, she wore white lacy stockings and a pair of cool Chuck Taylors as her wedding shoes. On a more "weird" rebellious level, she is a leading lady of her father-in-law! So having second thoughts about a rebellious idea you wanna do for your wedding? Think about these celebs and how they've held their head up high and got away with their amazing dream weddings just the way they wanted it, despite the debates about their choices. I think it's lovely that Regine and Michelle have become such good friends and have totally accepted the past with maturity. It's just funny of me that while I think it's cool with Regine and Michelle, I remember raising an eyebrow and gasping in disbelief when a friend of mine was getting married and asked her ex-bf (also a friend of mine) to design/make her wedding invites! Lol. Being famous has its own perks. I don't know, there is general friendliness and willingness to please from everyone, just to point out two of such advantages.